We lined up with only one change from the midweek European selection with McHugh being preferred to Francis-Angol and faced a Hibs team far short of what they considered to be their best. Our hosts took the kick off and proceeded to dominate the first twenty minutes if the half. Motherwell looked unsure and uncertain and rarely managed any meaningful possession as we were pinned back to the last third. Despite that Hollis was untroubled in our goal and there were no direct shots on target. Sutton and McHugh were strangers to the ball in that early period but we turned the play and showed some confidence as the passes began to find their target. McFadden had a roving brief and appeared on either wing as the need arose. Lasley had a pop but there was no further chance of breaking the deadlock until the closing minute of the half when an excellent move ended with Sutton’s header setting up Vigurs but the shot was high. We attacked the away end in the second period and McFadden produced a cut back to find McHugh on the spot but his weak effort trundled to Williams. 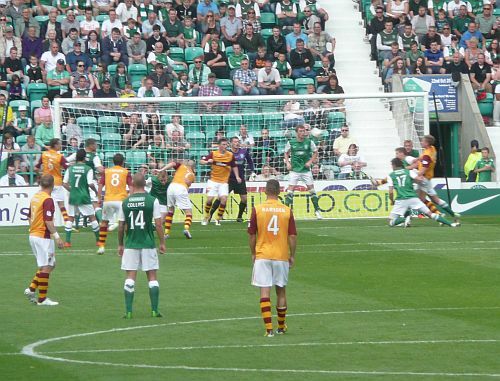 Craig tested Hollis with a long range free kick as Hibs began a spell of pressure. Hutchinson produced a saving tackle and moments later Robertson unleased a powerful shot that had Hollis at full stretch. The game was finely balanced after the hour and it looked like neither defence would be breeched. McCall decided to ring the changes and the balance was tipped in our favour. McFadden, McHugh and Lawson were replaced by Francis-Angol, Anier and Carswell as we stepped up the pace. Suddenly we had a threat on the left wing and ZFA skipped beyond the defence and delivered crosses to the box. Sutton won a race for a ball lobbed over the Hibs line and from the edge of the box he fired a low drive to the opposite corner. Williams managed a touch to deflect for a corner. Hutchinson then had a header just over the bar. The winner came in the 83rd minute when Anier’s speed outpaced the defence to offer the best chance of the match. He feinted to throw the ‘keeper and rolled the ball into the net. 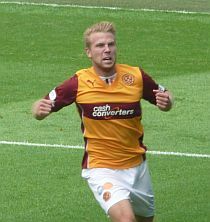 It was one of the few quality moments of the game and he was able to celebrate his SPLFL debut goal in front of the Motherwell fans. The win offers the best preparation for the midweek trek to Russia!